This page is for collecting information about learning to play the Erhu. Initially it is just an outline, but I'll keep adding information until it becomes a usable document. Most Erhu music is in 4/4 time ( 4 beats in a measure, quarter note is one beat). In Erhu, the key you are in is crucial. In the key of D, 1 = D 2= E etc. ex. In key of G 1=G etc. For rhythm, one number all alone is one beat. so 1 2 3 4 is four beats. 1 - is two beats 1 - - is three beats etc. A rest is marked as 0, and the rule for the rest length applies here. For notes less than a quarter, the standard line above as in normal music represents an eigth note. Two lines are sixteenth notes etc. For dotted notes 1 . means one and a half and all others apply. The legato is normal as are all other notations. All the keys are major and all sharps apply. 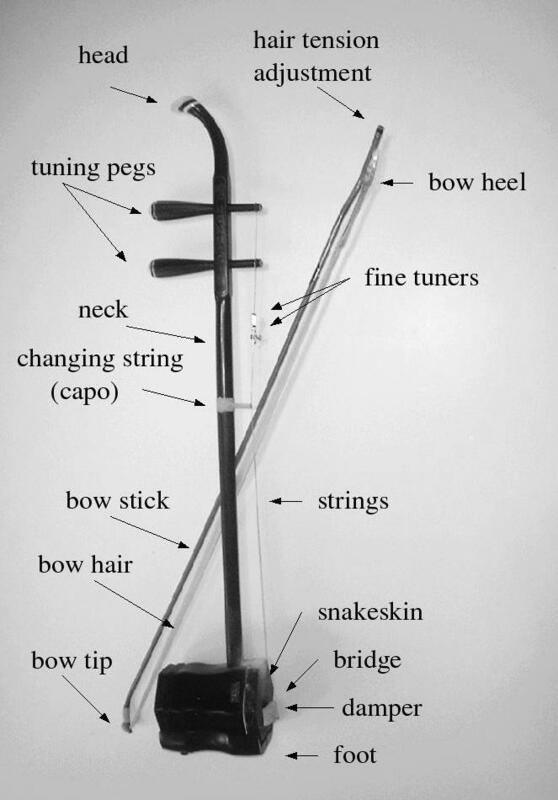 The history of the two-string stick-fiddle in China is around 500 years. The Erhu was considered folk music and was introduced by the barbarians of Mongolia. "Er-hu" actually means "the TWO string instrument from the ancient people", the first word "Er" meaning "two", and the second word "Hu" meaning "from ancient time". The general instrument is from great antiquity as the type is widely distributed around the planet on many different continents. In Afghanistan it is called "Ghichak" or "Gitchak". In Persia the instrument is called [Rebab or Rababah], dating from the 8th or 9th century. Indonesia (especially Sumatra, Java, and Bali) has a very similiar instrument now also called the Rebab which is often played with Gamelan ensembles. Curiously, the Indonesian Rebab [appears to have existed] in Indonesia prior to the Muslim contact. In Africa, there is the [Goge] made of a calabash gourd and covered with snakeskin and the [Imzad] covered with goatskin, both single string instruments. simple and compound duple, triple, etc..
SuperCalifragilistic <<Supercalifragilsiticexpialidocious>> A fun childrens song from the movie "Mary Poppins"
Listen to as many kinds of music that you feel you can love. As you learn more, you'll be able to appreciate more. Every thing you listen to, or let inside of yourself, will become part of your musical heritage. When you play without forcing or thinking, everything that you've loved will come out at the appropriate time. Think of yourself as Noah's Ark. Whatever you take into yourself is yours forever. A gardener can always give a cutting of a plant to his neighbor. Both the gardener and the neighbor are richer. The neighbor because she now has a fruit she never had, and the gardener because he can always ask for a cutting back if he ever loses his own precious plant. There is the story of a cellist who improvised by simply "jumping" to new notes. After making a random leap, he listened to the resulting sound and immediately corrected it to a "proper" note based on the feeling of the initial discordance. Rather than just sliding to the nearest "correct" note, he eventually added in grace notes, or even melodic phrases, to justify or explain the feeling of the initial "random" sound. Every time he "jumped", he had to be fully present and completely listening. The "random" sound, when listened to intently enough became a jewel which was placed in a "setting" by the subsequent notes. As the skill of the cellist grew, he made less and less awkward leaps, and got better and better at following the musical dance. In time, it was clear that this technique of "instantaneous" compensation allowed him to learn to play without planning or thinking. Once this happened, it was possible for everything that he carried inside, everything he loved, to spontaneously bloom into a garden of sound. Music is most beautiful when each element of the sound production is independant, yet working together as one. Consider every muscle to be an entity with a separate voice. Train them to be seperate, and then how to cooperate willingly with no coercion. Example. Each finger makes a different sound. Play D' with each finger in succession. Try every possible pattern. Start first to make each one imitate the other so that the different fingers sound the same - this trains the ear to hear what the essence of finger individuality is. After they can imitate each other, then you move to emphasize the individuality of the pinky from the ring finger. First make the canvas blank. Later on add the colors. As an experiment, try playing with the fingers under the string. Play with the back of the knuckles. How does the voice change? You can play anything you want without limit - even scratching noises - if you prove to the listener that the sounds are made with complete conciousness. If you want to use a "sloppy" bow, then it should be bracketed by impeccable technique, and should be done conciously to communicate something about the inner community to the outside. "Bad sounds" are sounds which are not conscious. If the player always changes the bow on every note and is not capable of making two notes on a single bow, this sounds bad. If the player always uses a draw bow on the downbeat, not for a specific effect, but because they can't do anything else, then this sounds bad. Practice all possibilities, so that you learn to play the way you intend, not just the way that you know. Music between people is a harmonious sharing of mind. Solo Music from occurs when the inner community is harmoniously integrated. When arm, finger, wrist, waist, shoulder, back, breath and mind are all independant, yet working together, then you have real music.